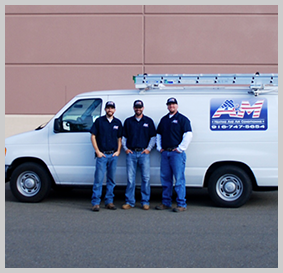 A&M Heating and Air Conditioning offers heating service in Sacramento and throughout Sacramento County. We provide installations, replacement, maintenance, and repairs for a variety of heating systems. We install furnaces, heat pumps, ductless mini split systems, zone control systems, thermostats and more! So whether your home is in Roseville, Folsom, Citrus Heights or anywhere in Sacramento County, we have you covered. We specialize in services for all brands of heaters. We can handle all of your heating needs; so if you live in Sacramento or surrounding areas, call us any time! Air Conditioning and Heating Services throughout Sacramento and Sacramento County. Call (916) 747-5654 for heating services in the surrounding Sacramento area. 15% off service call for first time customers! If you have a heating problem, we know that you want it repaired as quickly as possible. We give service calls priority so that your heating system is back in working order ASAP. If your heater has shut down, or if it isn’t working properly, call us. We are available for emergency heating repair services, and we will respond to service calls as quickly as possible. At A&M Heating and Air Conditioning, our Sacramento heating technicians are equipped to handle heater installations for new homes and upgrades to existing systems. If you are interested in retrofitting your home for better energy–efficiency, call us any time. We specialize in home efficiency and green heating products. We install a variety of high–efficiency models, including Energy Star heating systems, and we can get your home ready for a high–efficiency system with new ductwork or duct sealing for existing ductwork. For heating replacement in Sacramento, call A&M Heating and Air Conditioning. When we replace your heating system, we focus on designing the new system for quieter performance and higher efficiency. If you call us to ask about our replacement options, be sure to ask one of our heating experts about our monthly promotions. We make sure that the heating systems that we install are up to code and meet industry standards for efficiency and durability. We are available any time for a free consultation. Call A&M Heating and Air Conditioning for Sacramento heating services. We install a wide selection of high–efficiency heating systems, heat pumps, ductless mini splits, and more! We can install zone control systems to help you save energy, as well as programmable thermostats for any type of heater. Our Sacramento heating technicians are trained to repair all makes and models, and if your heating system needs maintenance, call us! We are here to handle all your heating needs, so call any time to schedule an appointment in Sacramento and throughout Sacramento County.